As we enter the fall season, the weather starts to drop, and we pull out our sweaters, fuzzy blankets, and slippers and cozy up on the couch. Even though our pets have fabulous fur coats, they can get chilly too. During the summer they might have laid flat on the hardwood floor to cool down, now they might be cuddling up next to you on the couch to share some heat. If you’re not around, they might look for another heat source to warm up, like heating vents, but that can results in burns to the skin. Providing your pet with a bed to keep them off the cold floor or a heating pad would be perfect to keep them cozy from fall through winter! In addition to providing your pet with a safe source of heat (especially if they get cold easily! ), heating pads offer many other great benefits your pet will love. Security – A heated pad or bed that provides your pet with a sense of being close to another living being. 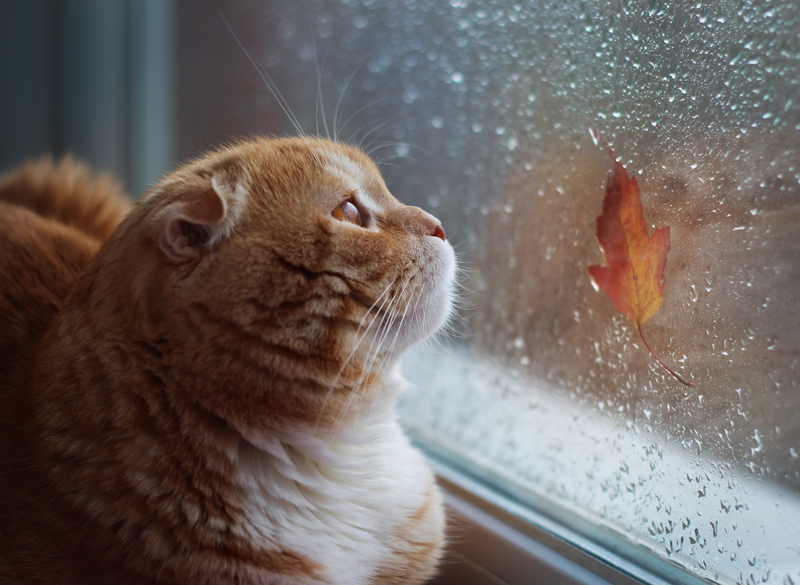 Mobility – When it gets cold outside, our pets might experience stiffness in the joints. Lying on a heated pad can help reduce the stiffness and increase mobility during those chilly nights. Therapeutic relief – A heating pad can help soothe aches and pains, relax muscles, and reduce inflammation in pets. 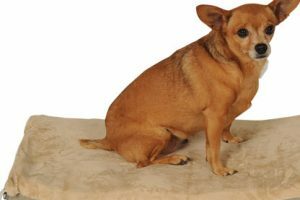 Heated pads are ideal for senior pets and pets suffering from arthritis and other joint disorders. Not only do they soothe joints and loosen tight muscles, they can also help your pet sleep more comfortably. 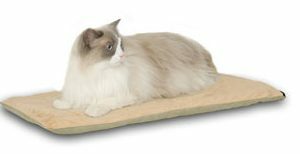 The Heated Pad is a comfortable indoor sleeping and lounging pad that helps your pet stay warm. 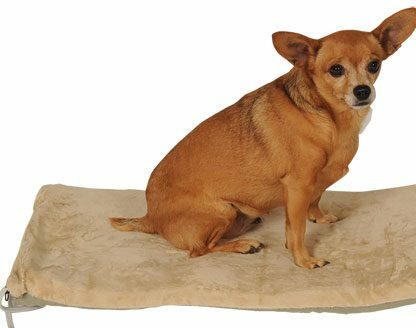 It can either be used alone or placed on top of your pet’s bed for extra comfort and warmth. The Heated Cat Pad is perfect for all cats, and the Heated Dog Pad is great for all small dogs. Both are especially great for arthritic or senior pets. Both the Heated Dog Pad and Heated Cat Pad must be plugged into an electrical outlet. The heat can only be activated when your pet sits on the pad (1 pound of pressure can activate the pad). The convenient size fits almost anywhere and has been tested for safety and does not cause a fire. Also, the mat cover and heating pad are removable for easy washing. Both the Heated Cat Pat and the Heated Dog Pad are available in two different colors: Sage or Mocha. Dimensions for the Heated Cat Pad are: 12.5″ W x 25″ L x 0.5″ H. Dimensions for the Heated Dog Pad are: 14″ W x 28″ L x 0.5″ H.
Win a FREE Heated Pad for your Dog or Cats! The weather is quickly going from sweltering to shivering. Keep your pet warm with a heated pad!! Just leave a comment below, and you could win a FREE Heated Pad from 1800PetMeds! Two winners will be chosen at random Thursday, October 4, 2018, so everyone who participates has a chance to win! There will be a total of two (2) winners. (Limited to residents of the U.S.) Good luck! Congrats to the drawing winners, Suzanne B and Nevella K! We’ll send you an email about claiming your prize. ← Hold the guacamole! Can dogs eat avocado? I have 3 perpetually cold fur babies who would love this for the cold winter in Vermont!! My Romeo is 11 1/2 yrs old and has arthritis pretty much in his entire back half. He has a hard time climbing up the stairs to the bed. I feel so bad for him, but I don’t have the money to pay for a heated pad, I’m on disability. I just make it to pay for his eye medication each month. Oh, we live in Minnesota where it gets really wet and really, really cold! We would do appreciate receiving a heated pad! Betty Boop is a big girl but always cold. She was A rescue but in truth she rescued me. I have a 6 year old Tabby named Natalie. She likes to get under the covers with me in bed when she feels cold. I would love to give my baby a heading pad!